What’s the Big Idea performing at the 2016 VVWF. The band returns to the Clarkdale Gazebo on Saturday, May 12. Photo by Miguel Guzman. How can you call an outdoor wine, beer, and food festival complete without adding the element of live music? Adding musicians to a festival sets the ambience and provides a memorable soundtrack to the day. Just as our wineries, breweries and fine food purveyors are expected to be local, so should our musical talent. Luckily for us, we didn’t have to look far to find some amazing musicians who will each be playing a set for the Saturday Main Event. Let’s meet the 2018 VVWF players. “Disciplined.” “Collaborative.” “A masterful ability to respect the groove.” That’s what music critics from the world of gospel, jazz, and funk have said about Glendale, AZ resident Fred Boswell, Jr. Earlier this year, Fred was one of four finalists to compete in the Guitar Center 28th Annual Drum-Off, where he went head-to-head with some of the top drummers in the country. For the Wine Festival, Fred is bringing together an ensemble of musicians and vocalists to bring a lively, engaging, funk-infused set to the Clarkdale Town Park. See more of Fred’s musical stylings here: https://www.youtube.com/watch?v=g404i2Hgndc. According to the Phoenix New Times, House of Stairs’ “grooves are jazzy and soulful, and improvisation is central to their performance, which has earned [them] a reputation as a jazz band. For what it’s worth, their music is often featured on local jazz station KJZZ, but their sound is closer to the ambient textures of Kid A-era Radiohead, while [Holly] Pyle’s vocals most evoke Beth Gibbons of Portishead.” The band is made up of lead vocalist Holly Pyle, Garrison Jones on keyboard, drummer Stephen Avalos and Shea Marshall, keys/sax/bass clarinet, also of The Sugar Thieves. Put them all together and you have a soaring, wide ranging set of moody jazz/alternative rock original tunes. See more of House of Stairs here: https://www.youtube.com/watch?time_continue=204&v=dDYe2crr0do. Thanks to repeat gigs at State Bar in Old Town Cottonwood, Four Eight Wineworks in Clarkdale, and other Verde Valley venues, What’s the Big Idea of Phoenix is building a strong following of both jazz lovers and those who have a fondness for 90’s-era alternative rock. The formula for the band is to keep it simple: no vocals, no loops or special effects. The magic is all in the unexpected arrangements of familiar tunes from Radiohead, Soundgarden, Pink Floyd and many more. 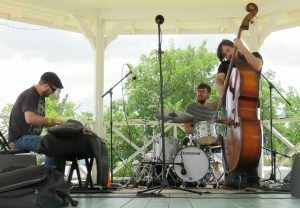 The trio consists of drummer David Drew, keyboardist Mike Kleinschmidt, an Josh Kneisel on stand-up bass. Check out a live recording of What’s the Big Idea at the Listening Room in Phoenix here: https://www.youtube.com/watch?v=z-dcKcesAdc. The trio will also provide the entertainment for our VIP platinum dinner with the winemakers on Friday night, May 11th. Take a listen, and tell us: which act are you most looking forward to hearing at the Festival?